Continue for step-by-step photos and a video of the blowtorch in action. 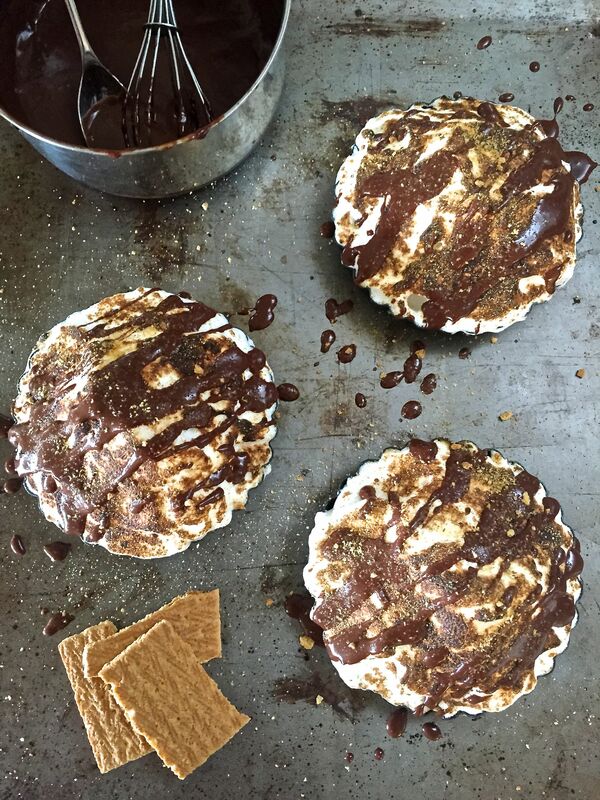 Click on any picture in the gallery for photos of the process of making the S’mores Baked Alaska. Leave a perimeter of crust uncovered by the ice cream. Spoon the meringue over the ice cream, making a seal against the crust. … and sprinkle more graham cracker crumbs. Enjoy! See how much we left of ours? And because fire is fun, enjoy this video of blowtorching the meringue! Click below to buy a blowtorch of your own. Don’t forget the butane fuel! Click here to pin the photo below to save the recipe for later! 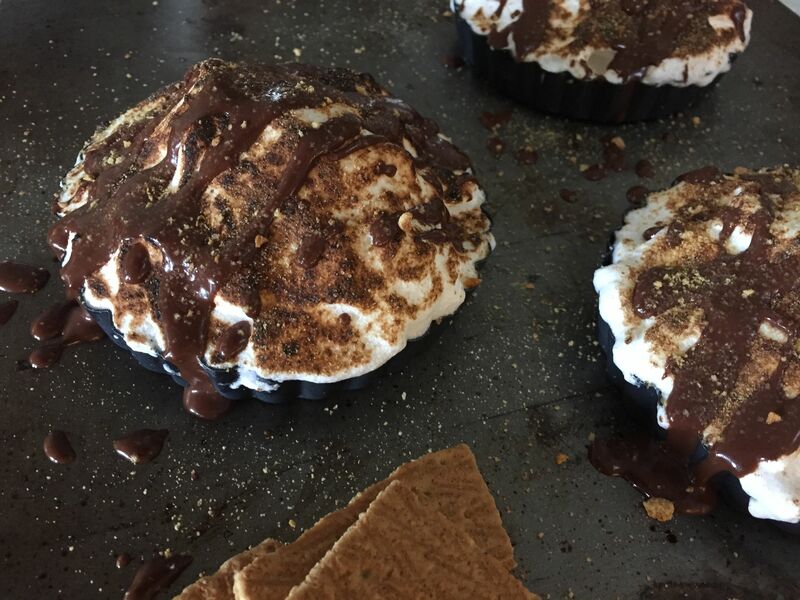 This entry was posted in Dessert, Food, Recipes to Make with the Kids, Restaurant Recreations, Step by Step with Pictures and tagged chocolate desserts, entertaining, pies, restaurant recreations. Bookmark the permalink. Ohhh goooood lord what I would do to have someone deliver me a couple of these on this rainy Monday. Kudos to ya girl. Well done! haha, thanks Jenny! Sending a virtual pie your way! Wow these look good!! I want one right now :)! Hi Abby! How neat that you recreated a recipe so well! I tried a hash sample at Waypoint Public during Taste of North Park but we haven’t had a chance to go back for a meal yet! This dessert sure does look tasty and not too difficult! Thank you, Lynn! Did you like the hash? We had it at the baby shower. I liked it, but there are so many great things on the menu, you should definitely make another trip back. Thanks for the inspiration! This might be what I need to take my weekend smores by the fire up a notch. I bet your girls would love it! If I hadn’t had cake for lunch, I’d be making this RIGHT NOW. Sounds like my kind of lunch! Oh Wow! What a great idea! My family would absolutely love these. I love idea of using the meringue in a pinch and turning the dessert into a baked Alaska! Kim, it was a family pleaser for sure. What a cool way to bring the restaurant experience home with you! I’ve never tried using a blow-torch, thanks for the tips. Lisa, I have to admit, playing with fire was pretty fun!